he Beulah Road trail was officially opened on Friday. The project is a culmination of many years of dedicated effort led by Jenifer Joy Madden. Jenifer wanted a safe way to walk and bike to Meadowlark Gardens Botanical Park located a short distance from her house. There was no sidewalk or trail and walking along Beulah Road was dangerous. Jenifer convinced Supervisor Hudgins that many people in her community wanted safe bike and pedestrian access to the numerous nearby parks, including The Barns at Wolf Trap and The Filene Center. Jenifer then worked with residents, including FABB's president Jeff Anderson, and county staff to obtain Federal funding for trail construction, and with then Congressman Moran's support, funding for a new ped/bike bridge over the Dulles Toll Road parallel to Trap Road. See the project website. Congratulations to Jenifer and her team and to the county for completing this work. 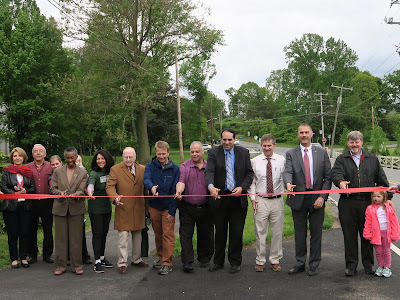 These new facilities have made it much easier to me and others who visit Wolf Trap and Meadowlark Gardens and the other parks in that area to more safely access these great resources. Update May 26: Article from the Connection newspaper, A Long Time Coming, But Finally Here. Many thanks to Jenifer and her team and the county. I run often from north of Leesburg Pike to the W&OD and surrounding neighborhoods and this trail and the new bridge have improved the quality and safety of my experience. I stumbled across this last year and was pleasantly surprised to see that a safe path largely existed (there were still bits that were not quite done yet). Kudos to everyone who was involved.